Asia’s emerging long-haul low-cost sector is ready to enter the US market in late 2015 with services to Hawaii from Malaysia’s AirAsia X and the Philippine’s Cebu Pacific. Hawaii will be the initial testing ground but mainland US destinations are possible over the medium- to long-term as new-generation widebody aircraft are placed into service. Asian long-haul LCCs will bring a new dynamic to the already intensely competitive trans-Pacific market. 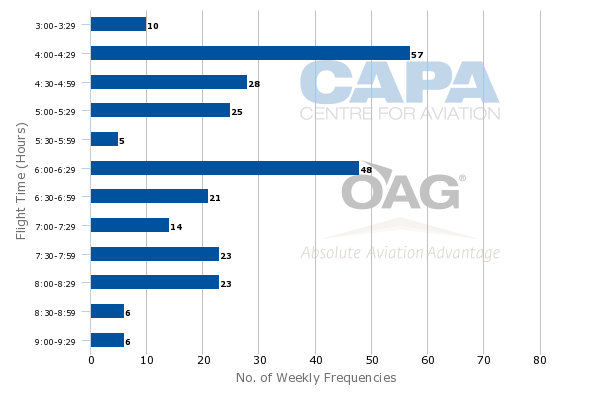 Asian widebody LCC operators have by some measures the lowest unit costs in the world. No US airline group has yet established a long-haul LCC but may need to look closely at the model as Asian operators join Australian, European and Latin American long-haul LCCs in serving the US. LCCs have a tiny fraction of the US long-haul market but they are starting to gain traction and Honolulu will almost certainly see a shake up as AirAsia X and Cebu Pacific enter. The Malaysia-listed AirAsia X Group submitted an application with the US DoT on 6-Apr-2015 to operate four weekly flights from Kuala Lumpur to Honolulu via Osaka Kansai starting 1-Nov-2015. The group will use fifth freedom traffic rights available to Malaysian carriers between Japan and the US. Malaysia Airlines (MAS) used some of these rights until Apr-2014, when it dropped its four times weekly service to Los Angeles via Tokyo Narita. Malaysia-Hawaii is (currently) a tiny market and will likely account for a small fraction of the passengers between Osaka and Honolulu. 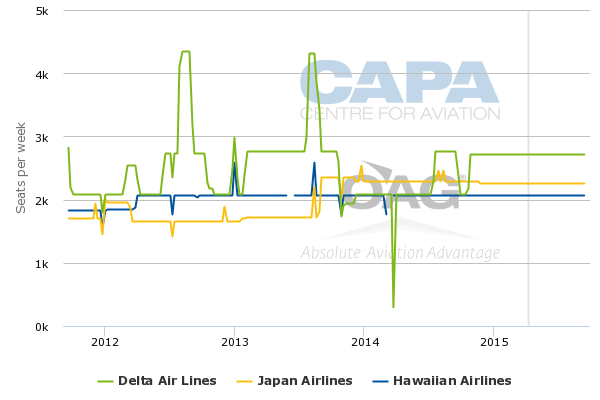 However Osaka-Honolulu is a relatively large and primarily outbound market that is currently served non-stop by other three airlines – Delta, Hawaiian and Japan Airlines (JAL) – with one daily flight each. AirAsia X, which operates 377-seat A330-300s, will account for about an 18% share of total scheduled seat capacity between Osaka and Honolulu once it enters the market. 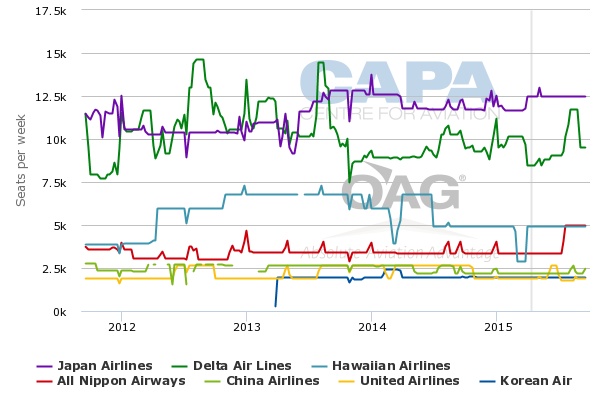 Delta Air Lines is currently the market leader with about a 39% share as it operates the route with 747-400s. JAL, which uses 777-200s, accounts for approximately a 32% share while Hawaiian, which uses A330-200s, accounts for the remaining 29%. The new US route is part of the unfolding "connecting the dots" strategy which is integral to the pan-Asian AirAsia model. This model in many ways imitates the traditional full service connectivity operation, but with inbuilt economies. Malaysia's AirAsia X for example now achieves about 50% transfer traffic over its Kuala Lumpur hub, connecting into its own onward services as well as onto short haul sister company AirAsia. In the case of Japan, domestic connections on the Japan end will be key for AirAsia X, in aggregating traffic. By offering domestic connections, AirAsia X will be able to plug into the broader Japan-Hawaii market. Currently there are about 35,000 weekly seats between Honolulu and Japan operated by seven airlines. Two of these carriers already serve this market with fifth freedom uplift rights – Taiwan’s China Airlines and Korean Air – but those are from Tokyo rather than Osaka, a largely different market. AirAsia X’s decision to serve Honolulu via Osaka could indicate that AirAsia Japan will have a large presence at Kansai, which is the main base for Japanese LCC Peach, part owned by All Nippon Airways. Nagoya was expected to be the initial base for AirAsia Japan but AirAsia X dropped services to Nagoya in Feb-2015. Even if AirAsia Japan establishes its first base at Nagoya it could still operate several domestic as well as regional international routes from Osaka. AirAsia Group CEO Tony Fernandes has said he will also be discussing cooperation options - or more - with the ailing Japanese homegrown LCC, Skymark. Skymark has a significant domestic network. Other AirAsia long and short haul JVs will be able to feed into an Osaka "hub"
Malaysia AirAsia X currently still serves three gateways in Japan from Kuala Lumpur – Osaka Kansai, Tokyo Nagoya and Tokyo Narita. Each destination is served with one daily flight. The group also operates two other long haul low cost joint ventures, one in Thailand – Thai AirAsia X (TAAX) – and Bali-based Indonesia AirAsia X (IAAX). TAAX currently operates one daily flight to Osaka from its Bangkok hub while IAAX is also seeking to serve the Japanese market. AirAsia X will be able to offer Honolulu passengers connections to Bangkok and potentially Bali if IAAX launches services to Osaka. AirAsia X will also offer a one-stop same plane product from Honolulu to Kuala Lumpur (as required in order to secure the Kansai-Honolulu traffic rights). But the number of passengers making AirAsia X to AirAsia X connections at Kansai will likely be small as Bangkok and Bali are not large markets for Hawaii. Similarly AirAsia is unlikely to generate a large number of passengers by offering a two-stop product throughout Southeast Asia using short-haul affiliate Malaysia AirAsia in Kuala Lumpur and short-haul affiliate Thai AirAsia in Bangkok. Hawaii-Southeast Asia overall is not a large market except for Hawaii-Philippines. But as Philippines is the closest Southeast Asian county to Hawaii flying via Japan and Kuala Lumpur (or Bangkok) would be an extremely circuitous route. All that said, one of the features of LCC operations on new routes is the ability to stimulate "unpredictable" new traffic. This will constitute at least part of the new flows. Meanwhile, Philippines based long haul low-cost Cebu Pacific will be targetting Hawaii's a large Filipino population. DoT approval is fairly routine and focuses on a foreign applicants’ economic fitness. The other approvals often take longer than expected, particularly for an airline group that does not have any prior experience with the US market. The AirAsia X announcement of its application to the US DoT was not a surprise as the group has been talking up over the last couple of months the possibility of serving Hawaii as well as resuming services to Europe. AirAsia X interim CEO Benyamin Ismail said in a 12-Mar-2015 CAPA TV interview that the airline was looking at using Japan as a stepping off point for Hawaii and eventually the mainland US while India could be used as a base for new services to Europe (AirAsia has a short haul JV based in India, India AirAsia). But the US was not on the radar screen for AirAsia X until relatively recently, although Europe as been a priority since AirAsia withdrew from that market in 2012. Launching a new route to Europe is a relatively easier and less risky path compared to the US because AirAsia X has previously served the EU. AirAsia X suspended services from Kuala Lumpur to both London and Paris in early 2012 as part of a network restructuring to focus on medium-haul services within Asia-Pacific. Both routes were highly unprofitable but at the time were operated with inefficient four engine A340s at a time when fuel costs were punitive. AirAsia X will soon complete a transition to an all A330-300 fleet and start taking delivery of a high gross weight variant which will have the range to reach Europe non-stop. Lower fuel prices and the upcoming restructuring at local competitor, flag carrier MAS, which is expected to focus on Europe as it cuts capacity, also makes Europe a more appealing market than three years ago. Hawaii could prove to be more challenging as AirAsia will not be able to rely on its home market of Southeast Asia. AirAsia has established its brand in Japan but not nearly to the extent it has in Southeast Asia. Japan-US is a highly competitive market and outbound demand has been weakened by the depreciation of the yen. As Honolulu is almost entirely an outbound route this may not be the ideal time for an influx in capacity. But AirAsia has the advantage of a much lower base. The crews for the new Osaka-Honolulu flights will be based in Malaysia, where labour costs are significantly lower than Japan or the US (although rotating crews across two legs with overnights in both Osaka and Honolulu will offset some of this inherent advantage). AirAsia’s effectiveness at competing against Japanese and US legacy carriers in the Japan-Honolulu market will be fascinating to watch. The Philippines-Honolulu market will not have the same dynamics as Cebu Pacific enters because Hawaiian Airlines dropped Manila in 2013, leaving Philippine Airlines as the only carrier with non-stop services between Manila and Honolulu. AirAsia and Cebu Pacific will be the fourth and fifth long-haul LCC serving the US. Australia-based Jetstar Airways became the first of the current generation of long-haul LCCs to serve the US at the end of 2006, when it launched services to Honolulu from Melbourne and Sydney. Jetstar also now serves Honolulu from Brisbane. Jetstar and Canada’s WestJet are the only LCCs currently operating international services from Honolulu. It was another seven years before Norwegian became the second of the current generation of long-haul LCCs to serve the US in 2013. Norwegian currently serves five destinations in the US (Fort Lauderdale, Los Angeles, New York JFK, Oakland and Orlando) and operates trans-Atlantic services from four of its bases (Copenhagen, London Gatwick, Oslo and Stockholm). Brazilian LCC Azul launched its long-haul operation at the end of 2014 and currently serves Fort Lauderdale and Orlando from its hub at Sao Paulo alternative airport Campinas. Azul also intends to add services to New York. Melbourne-Honolulu, which is Jetstar’s longest route, is about 10 hours on the outbound and 11 hours on the return leg. Osaka-Honolulu is about seven hours flying time outbound and nine hours on the return sector, while Manila-Honolulu is slightly over 10 hours in both directions. While operating to the US poses several challenges, the length of the planned Honolulu flights for AirAsia X and Cebu Pacific are not unusual. AirAsia X already operates a slightly longer route in Kuala Lumpur-Jeddah (about nine hours) and most Kuala Lumpur-Europe routes would be significantly longer than Osaka-Honolulu. Cebu Pacific’s longest current flight, Manila-Kuwait, is also about 10 hours. Serving the mainland US however would be more momentous. Japan-Los Angeles is about a 10 hour flight and nearly 12 hours on the return leg. Manila-California, should Cebu Pacific pursue non-stops and acquire longer range widebody aircraft, is 13 to 14 hours. Making such long flights viable over the long-run under the low-cost model would be difficult, even if fuel prices remain low. But shorter long-haul routes to Hawaii give Asia’s emerging long-haul LCC sector an opportunity to test the US market and to build on the "connecting the dots" model. While the Honolulu market has big risks it is far less risky than trying to serve the mainland. Legacy carriers in both Asia and the US will certainly be watching closely as AirAsia X and Cebu Pacific test out their models in Hawaii.